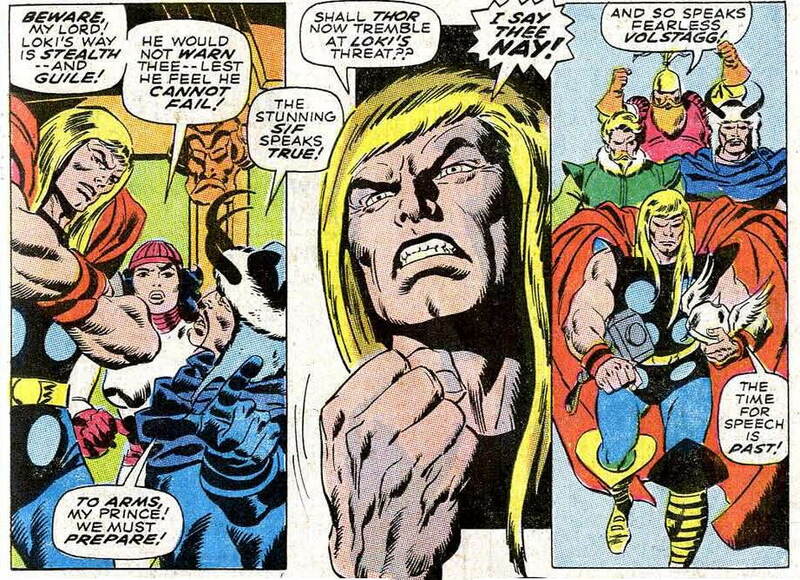 As I’ve recounted in previous posts, I first made the acquaintance of Marvel’s take on the Norse god of thunder in the summer of 1967, via Avengers #45 (which also happened to be my very first Marvel comic), in which he appeared in only the first few pages. I didn’t encounter him again until almost a year later — this time in the pages of Avengers Annual #2, in which he played a somewhat more substantial role — but I didn’t get around to buying an issue of Thor itself until September, when the cover of #158 caught my eye. 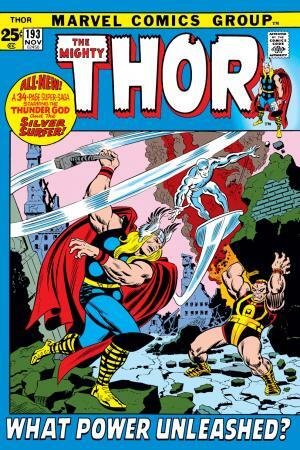 That turned out to be a pretty good first issue to purchase, since it reprinted in full Thor’s origin story from Journey into Mystery #83, and its new-material framing sequence by Stan Lee and Jack Kirby also introduced me to a number of the settings and characters that had been brought into the series post-origin, such as Asgard, Odin, the Lady Sif, and so forth. I enjoyed that comic book quite a bit, but for whatever reason, I didn’t pick up another issue of Thor for several months. 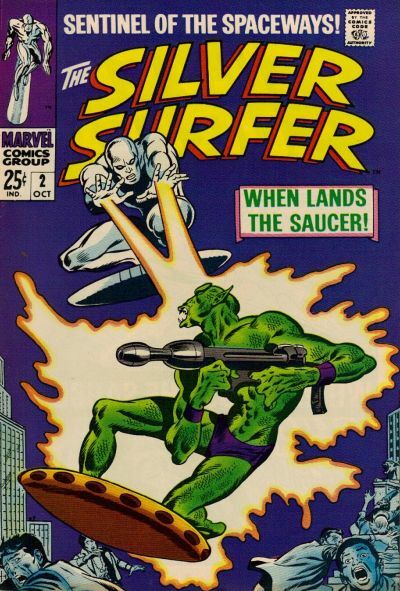 As for the Silver Surfer, I’d bought the first issue of his comic back in May, and had liked it — but, for whatever reason (perhaps because I simply never saw it on the stands), didn’t get the second issue when it came out two months later — nor did I buy the third. But the fourth issue — well, I know that I definitely did see that one, because I put my twenty-five cents down on the convenience store counter and bought it. I mean, obviously — I had to buy it. How could any Marvel Comics fan possibly pass up a book with that cover? Like the similarly classic Jim Steranko cover for Captain America #110, a comic which came out the very same month (and was blogged about here just a couple of weeks ago), the cover that graced Silver Surfer #4 carried no text besides that required by the book’s trade dress. Also like CA #110, this cover — penciled by John Buscema, and inked by his brother Sal — depicted two of Marvel’s headliners about to come into violent conflict. It’s a thrilling and dramatic, yet also graceful and even elegant composition, which doesn’t seem to have aged a day, let alone fifty years — which may be why it still routinely ends up on “best comic book covers” lists online. (Indeed, the cover gets posted to the Facebook group “Greatest Comic Book Covers Ever Ever Ever” so frequently that the group description cautions new members about doing so — sure, they can post it if they really want to, but they’d better be prepared for the inevitable hazing). It’s been said that no one draws a brooding character slouched in a chair better than John Buscema, and here’s a great early example of such. 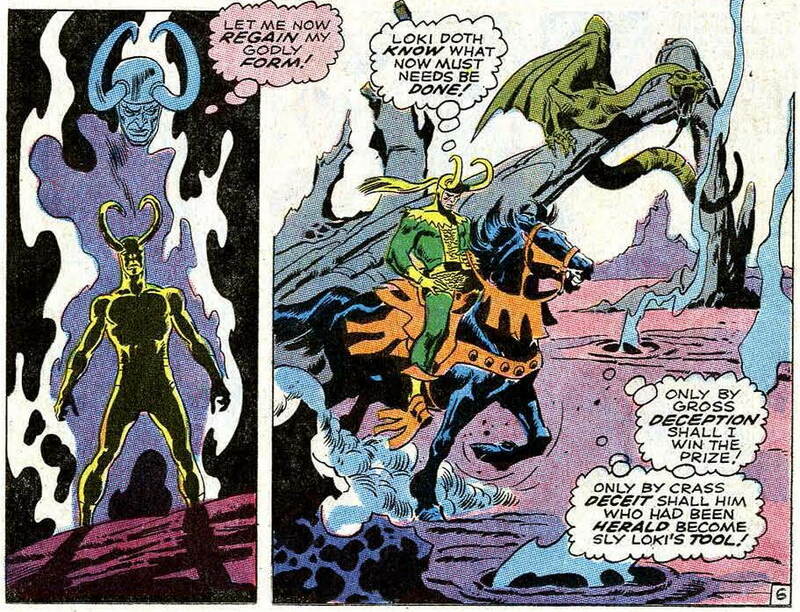 This was my then eleven-year-old self’s first real encounter with Marvel’s Loki — he’d appeared in one panel of Thor #158’s framing sequence, but wasn’t named there — but I was almost certainly already familiar with the name from reading about Norse mythology in school. 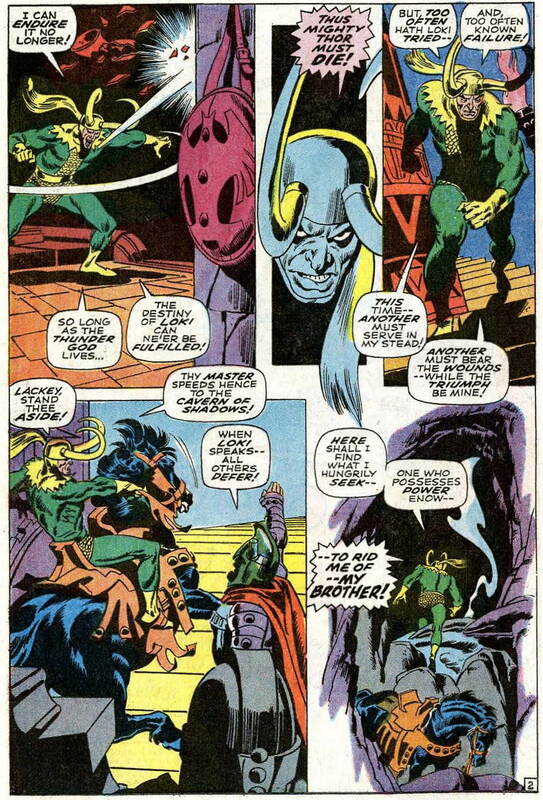 Of course, in mythology Loki was a somewhat more ambivalent character than the god of out-and-out evil that Marvel portrayed him as in the Sixties — though I’m not sure how much I understood such nuances in 1968. 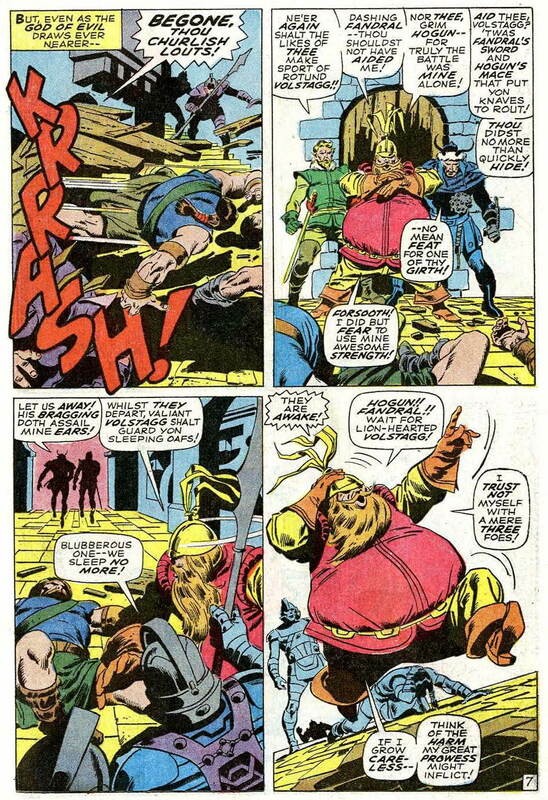 The big robotic-looking guy that the Thing is clobberin’ in the first panel of page 4, above, happens to be Tomazooma, who was featured as the villain in Fantastic Four #80 — which was probably the latest issue out when John Buscema penciled this story. As that issue was the second FF comic I’d bought, I recognized the reference; and I can remember appreciating the nod to current continuity. 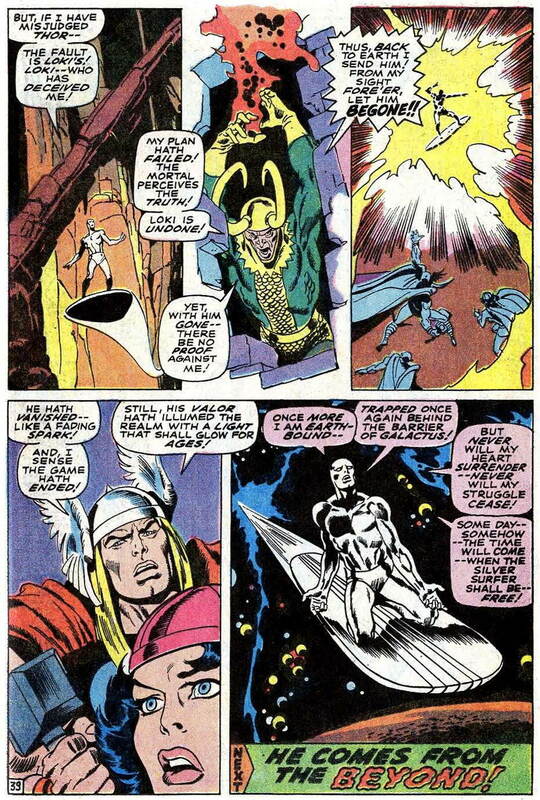 Calling on his mystic powers of divination, Loki discerns the Silver Surfer’s origin story, as related in issue #1 (which is neatly recapped here by the elder Buscema and his collaborator, editor/scripter Stan Lee, in just a handful of panels) — and determines to manipulate the Surfer into attacking Thor by promising to free him from Galactus’ barrier, so that he may at last leave Earth, and return home to Zenn-La and his beloved Shalla Bal. 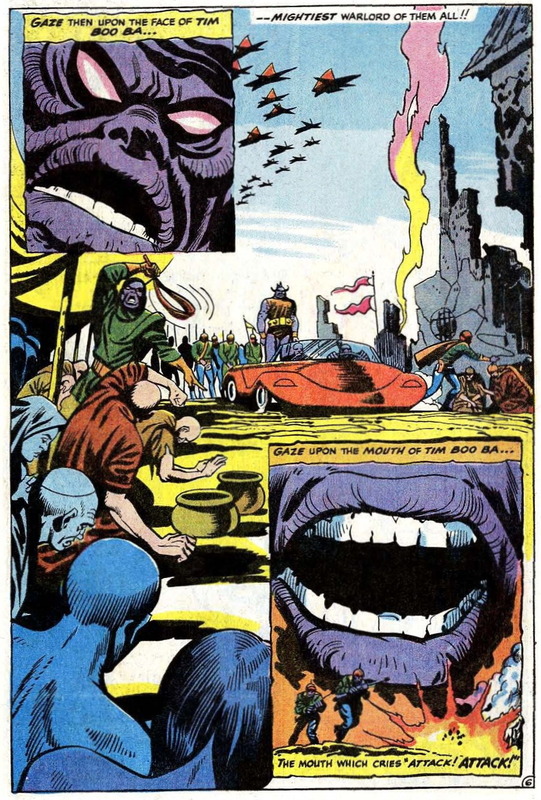 In his later years, John Buscema frequently avowed that he hated drawing superheroes, and in fact didn’t enjoy drawing any of the mundane aspects of modern life (cars, clothes, buildings, etc.) that generally went along with that genre. 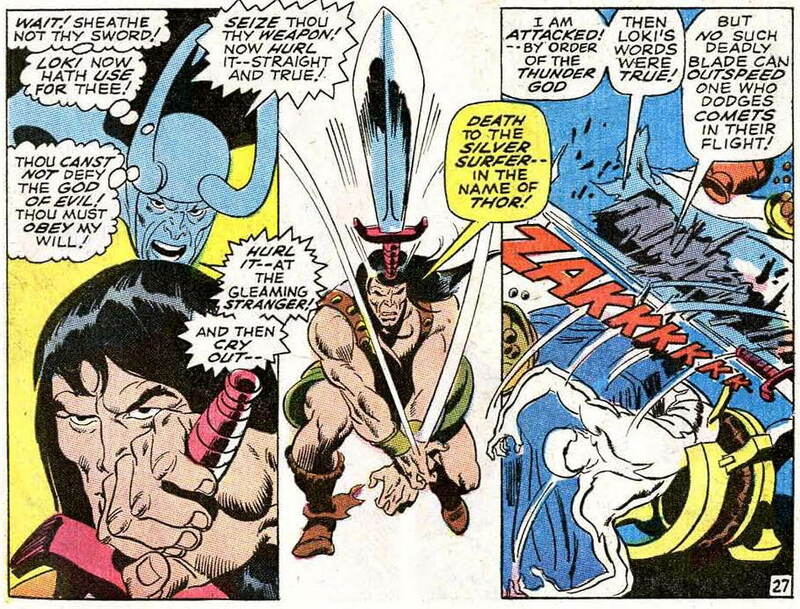 According to the artist, he vastly preferred drawing the barbarian fantasy hero Conan, as well as Thor “when it was in Asgard” (Alter Ego #15, p. 11). 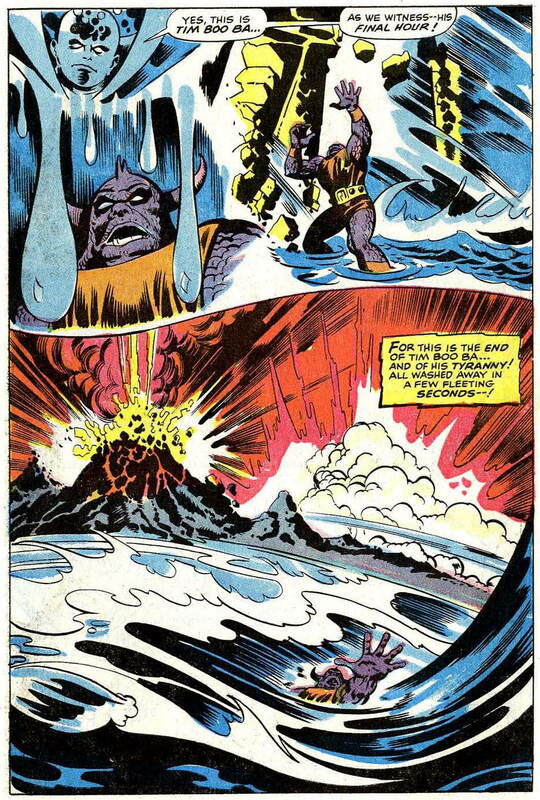 His enthusiasm for the imaginary, archaic settings of Asgard and its environs is well in evidence in these early pages of this story, Buscema’s first opportunity to explore a heroic fantasy world at Marvel Comics. 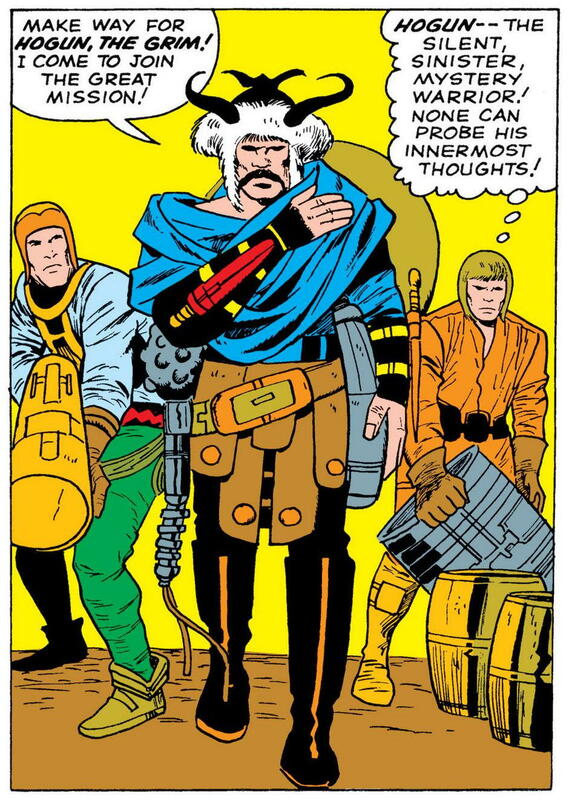 Of course, in 1968, I was probably still a year or so out from realizing that Fandral was based on the swashbuckling movie roles of actor Errol Flynn, or that Volstagg was derived from Shakespeare’s immortal character Sir John Falstaff, or that Hogun was inspired by… um… Genghis Khan, maybe? (Yeah, I know that Lee said he came up with Hogun because he wanted to have “a guy like Charles Bronson” [that’s another movie actor, just in case you didn’t know] in the group — but that Mongol look and vibe had to come from somewhere.) 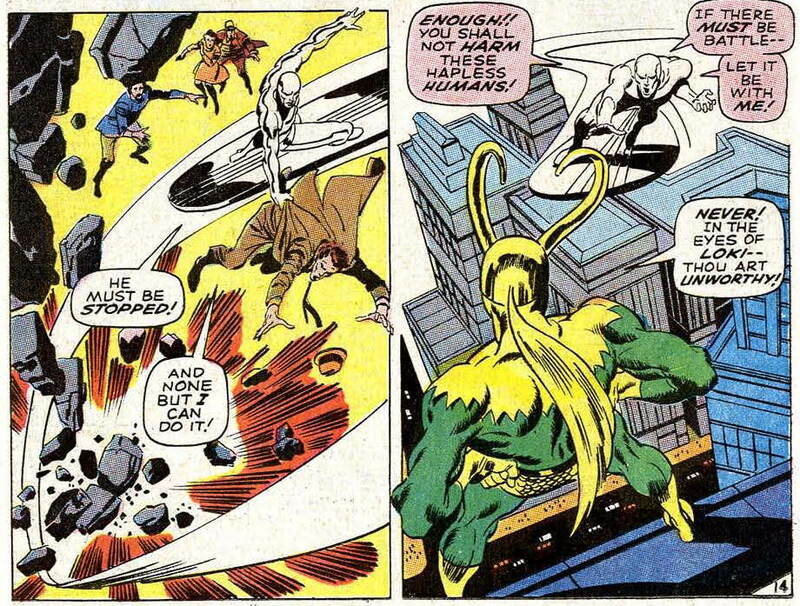 And I was even further out from coming to the belated realization that the trio were, when all was said and done, basically the Asgardian version of the Three Musketeers. (Fandral=Aramis; Hogun=Athos; Volstagg=Porthos.) Back in 1968, however, I didn’t really need to know any of that to conclude that these guys were fun to read about. I’d be inclined to say that this beautiful page is a tribute to John Buscema’s stated preference for drawing animals and other aspects of the natural world over modern technology, cities, etc., but the fact is that Buscema was generally excellent at drawing all of those as well (just as he was with his famously disdained superheroes) — which makes it difficult to argue for a causal relationship between the artist’s enthusiasm for his subject and the quality of the resulting artwork. 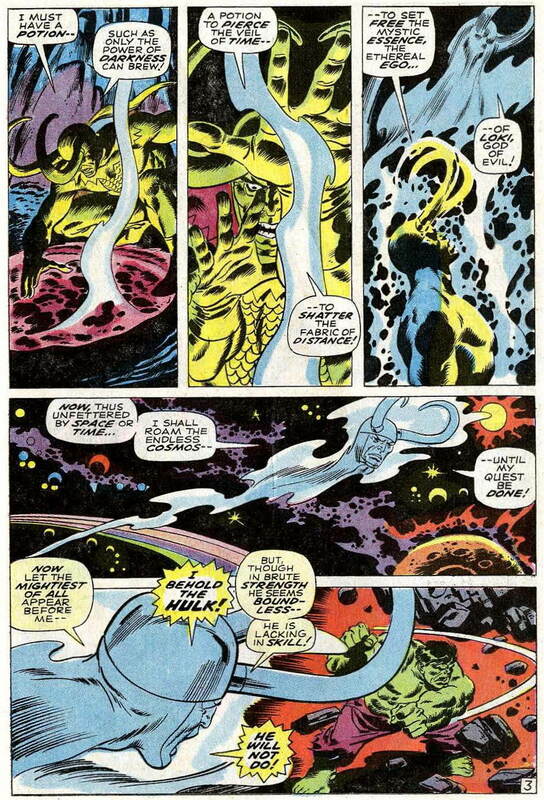 Be that as it may, this is simply a great page; the top panel, in and of itself, is surely one of the most indelible images of Buscema’s whole run on the Silver Surfer series. But it must also be said that the page showcases its writer every bit as much as it does its artist. As I write these words, it’s been less than a week since the passing of Stan Lee. Among the vast number of tributes to Lee that have filled both traditional and social media over the past several days, many have cited the writer’s positive influence on their own developing moral philosophy, via the ethical precepts that his heroes regularly demonstrated by their actions, and sometimes also declaimed outright. 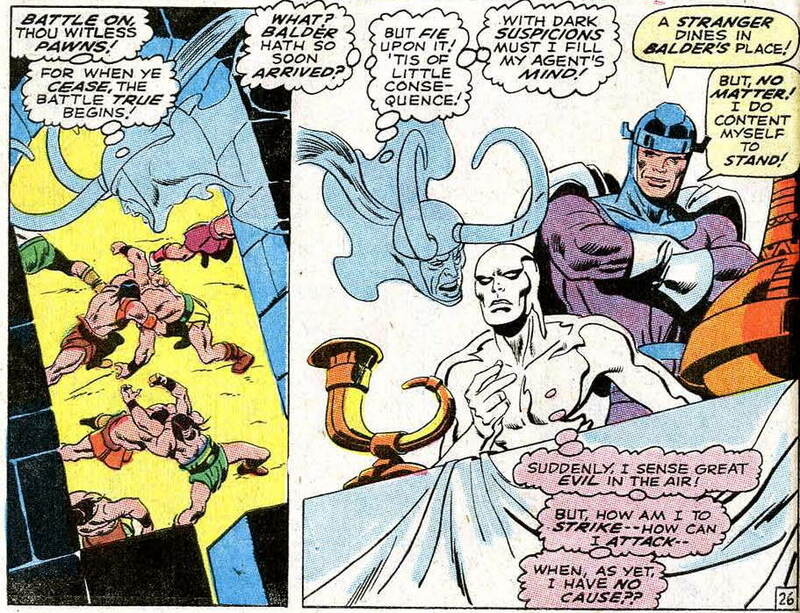 And no other character served as a vehicle for Lee to verbally articulate his own philosophy — his ideas about what was important and true in the world, as well as what was good — as much as did the Silver Surfer. 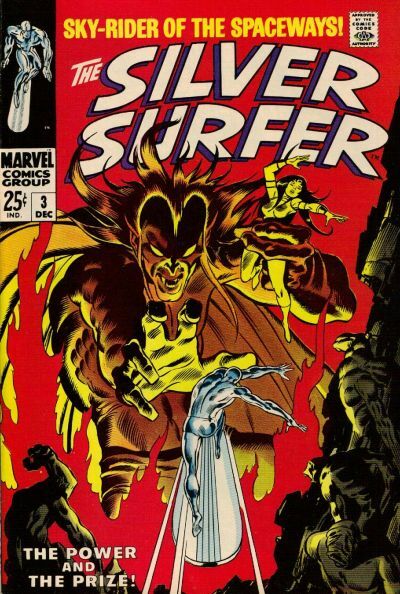 Setting aside for the moment the vexing question of whether or not the Surfer, as originally conceived by his creator Jack Kirby, was in fact an appropriate mouthpiece for Lee’s idealistic rhetoric*, we’re left with the matter of the rhetoric itself. I know that for some readers, the ideas and sentiments expressed by the Surfer seem trite and simplistic; the language of his soliloquies, overly flowery and pompous; and the whole mode of expression, heavy-handed and self-important. And maybe I would see things the same way, if I first encountered Lee’s Silver Surfer now, as a mature and (reasonably) well-read adult. But I didn’t, of course; I encountered it as a child, at a time when my own sense of what was important, true, and good was still under development. And in that time, the underlying message of peace, love, and understanding that Lee conveyed through the Surfer’s musings spoke to me. It was, dare I say it, good for me. 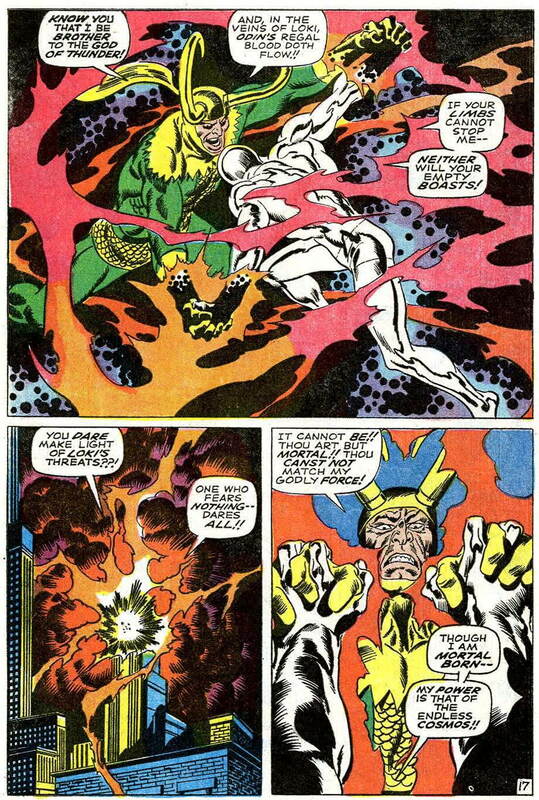 In this scene, the Buscema brothers’ delineation of cosmic and mystic energies run wild is significantly enhanced by the imaginative and varied coloring (uncredited, as were all Marvel coloring jobs of this period, but reputed to have been done by veteran artist Bill Everett). 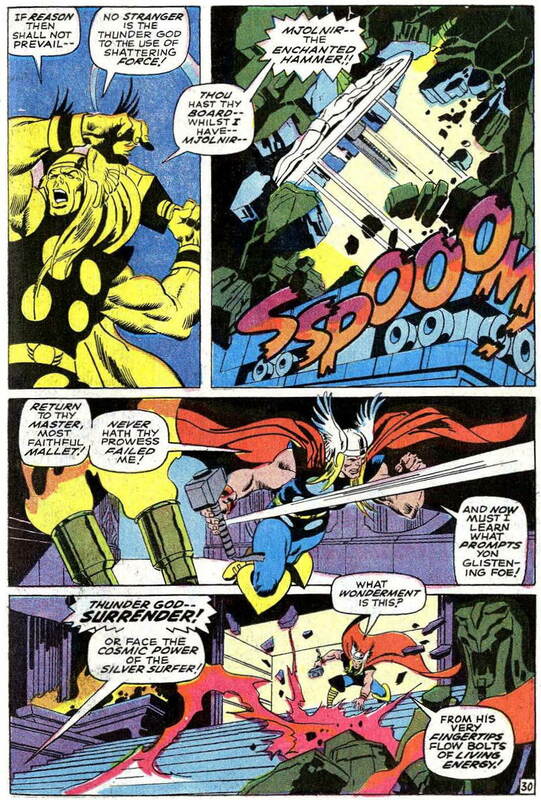 Of course, what Thor is actually doing is marshaling Asgard’s defenses in preparation for Loki’s threatened attack — which is just what the trickster had in mind when he made his boast to Fandral and Hogun, some eleven pages back. 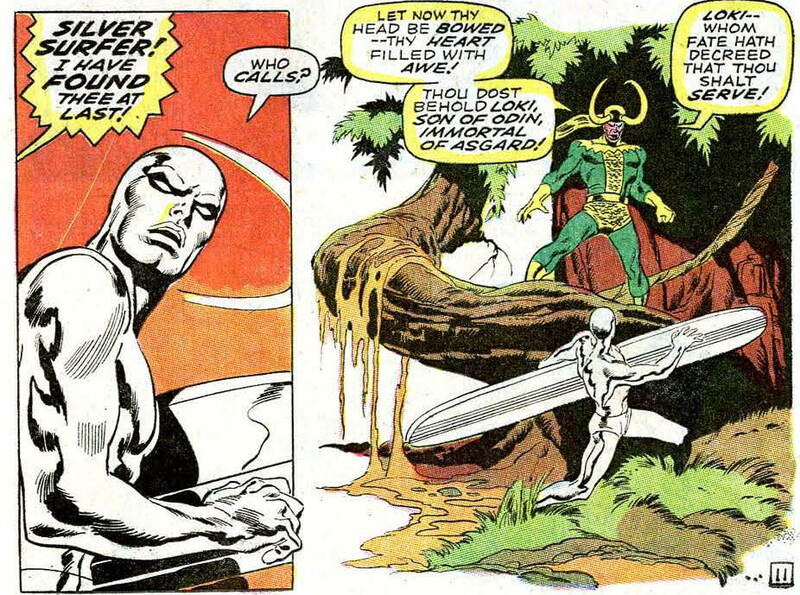 Heimdall, of course, is another authentic figure out of Norse mythology, whom I’d also seen in Thor #158. Let’s pause here a moment to note that we’re now 21 pages into a 39-page story — and we still haven’t gotten to the main event, the Surfer vs. Thor, yet. 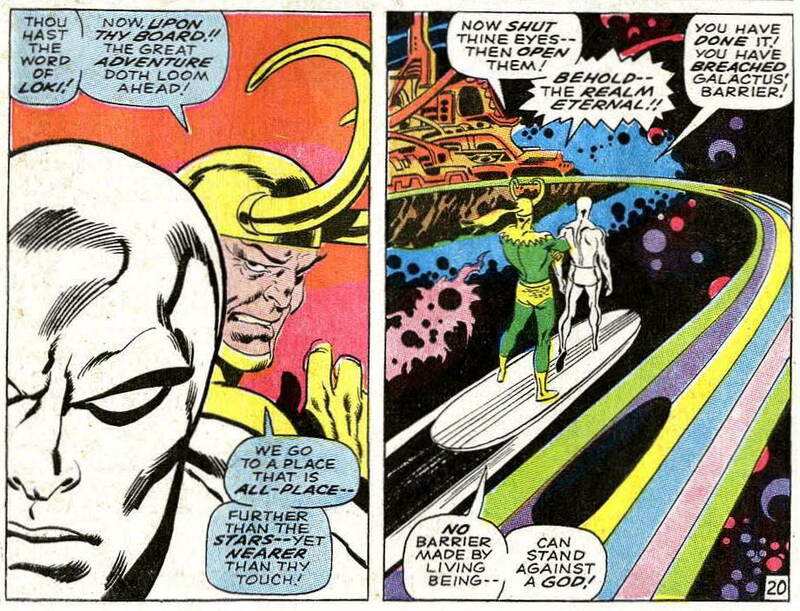 But I think that undercard bout of the Surfer vs. Loki was worth the space, don’t you? 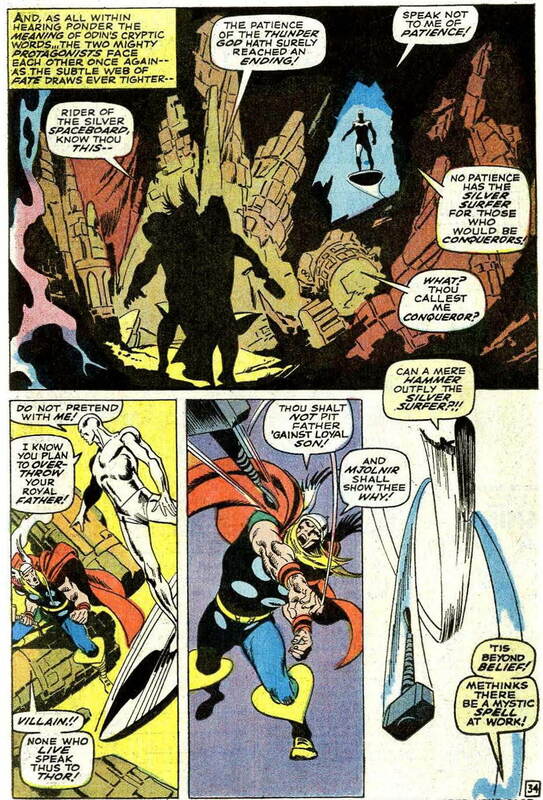 In 1968, readers who were already more familiar than I was with Marvel’s Asgard might have realized that John Buscema was giving them a somewhat less shiny and science-fictional Golden Realm than the version imagined by Jack Kirby, in favor of a more organic, perhaps more authentically Norse (or at least authentically medieval) representation. 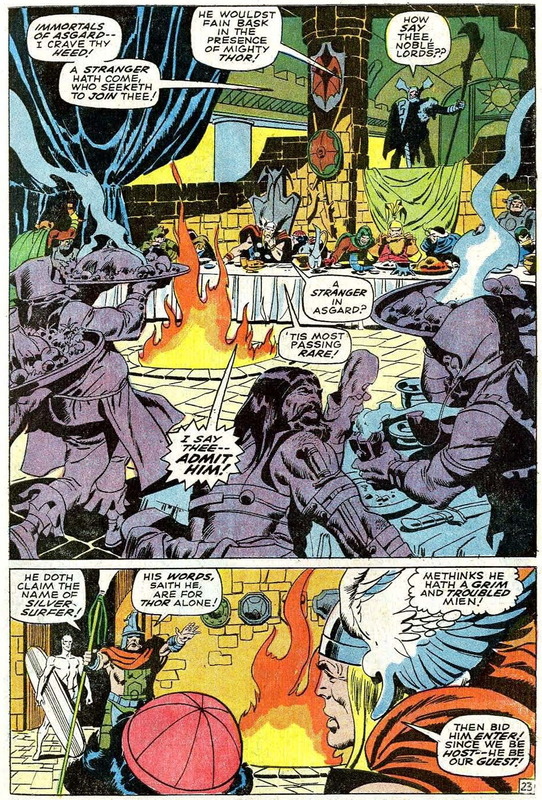 Buscema’s interpretation was an entirely valid one, of curse, reflecting his own interests as an illustrator as well as his appreciation for such classic comics works as Hal Foster‘s “Prince Valiant”. 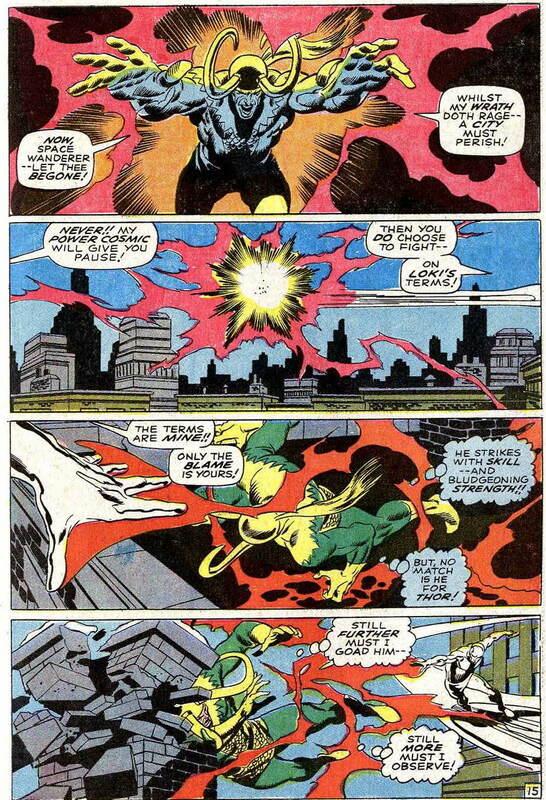 It’s also an interpretation that worked just fine for me, and, I suspect, for the majority of comics readers — although at least one important critic was decidedly unhappy with Buscema’s take. As it happened, that individual’s displeasure would prove to have a significant effect on the artist’s approach to his work for Marvel, going forward — but further discussion of that matter will have to wait until after the conclusion of our tale. 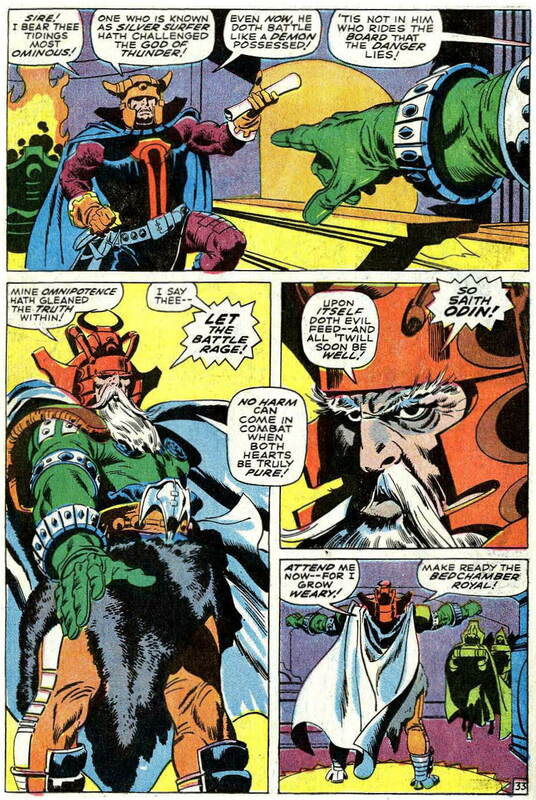 Thor orders the Warriors Three to stand down, and then courteously tells the Surfer that he’s prepared to meet his challenge, at the appropriate time and place. 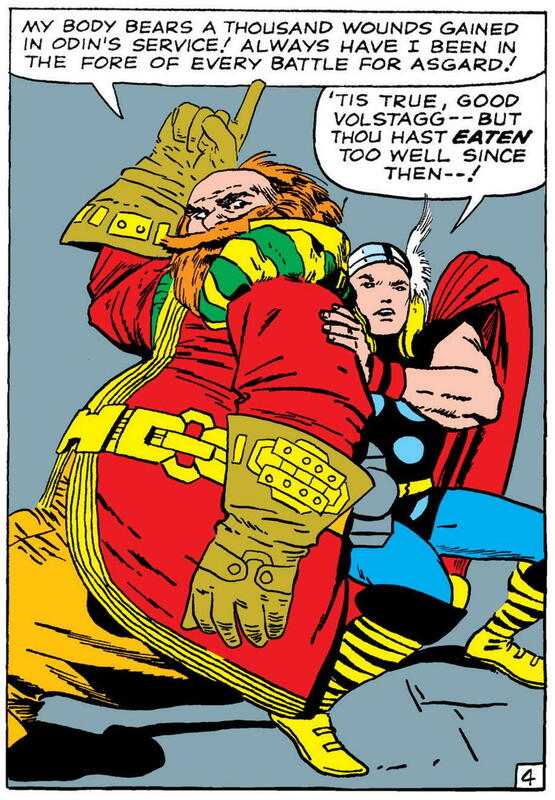 First, however, they should have dinner; and while they’re chowing down, why doesn’t the Surfer tell the Thunder God just what his beef with him is? And finally, here’s Balder! 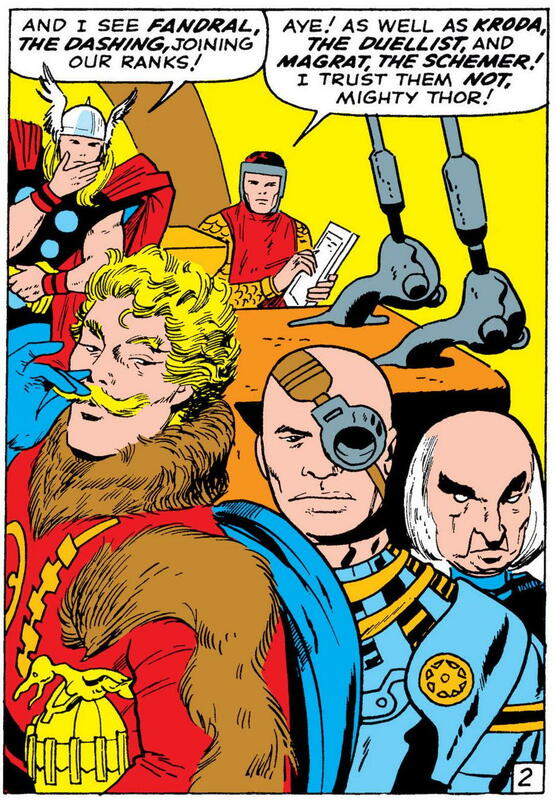 — whom, as it turns out, I had already seen (albeit briefly) in Thor #158 — though, like Loki and the Warriors Three, he’d gone unnamed there. 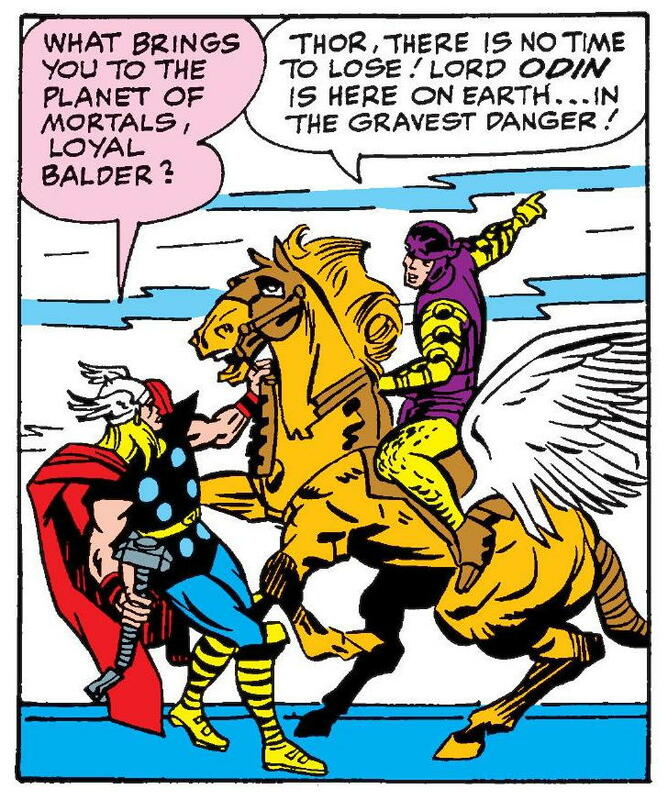 The Marvel version of Balder had first been referenced in Journey into Mystery #85 (the same issue that introduced Marvel’s Loki), but his real debut didn’t come until some nineteen issues later, in JiM #104‘s classic “Giants Walk the Earth” — the first feature-length Thor story in which Stan Lee and Jack Kirby fully immersed themselves in the richness of Norse mythology. 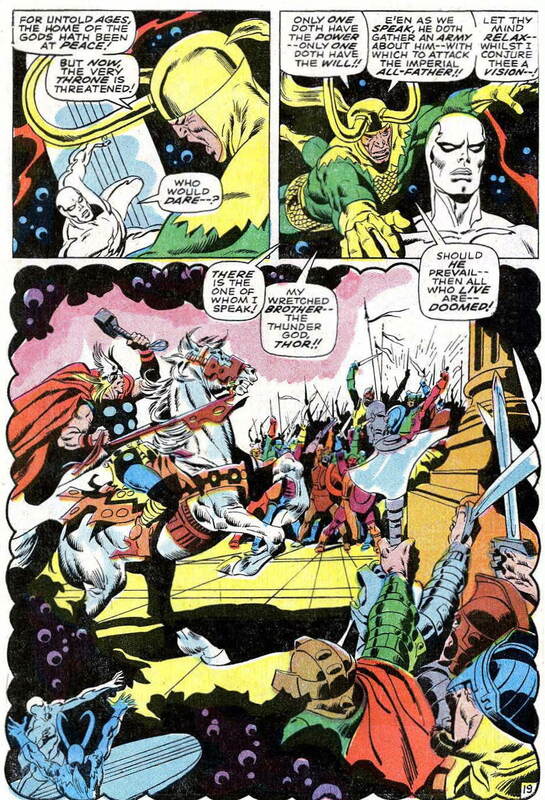 Moving on now to page 27, we see the “jousting” conclude with one warrior left standing — but even as the victorious champion accepts his trophy, a sword, from Thor’s hands, the shade of Loki begins to whisper not-so-sweet nothings into his ear. And hey, now that we see him in close-up, does this guy remind you of anyone? Maybe another long-haired, barbaric-looking warrior whose exploits John Buscema would famously draw, not too many years later? 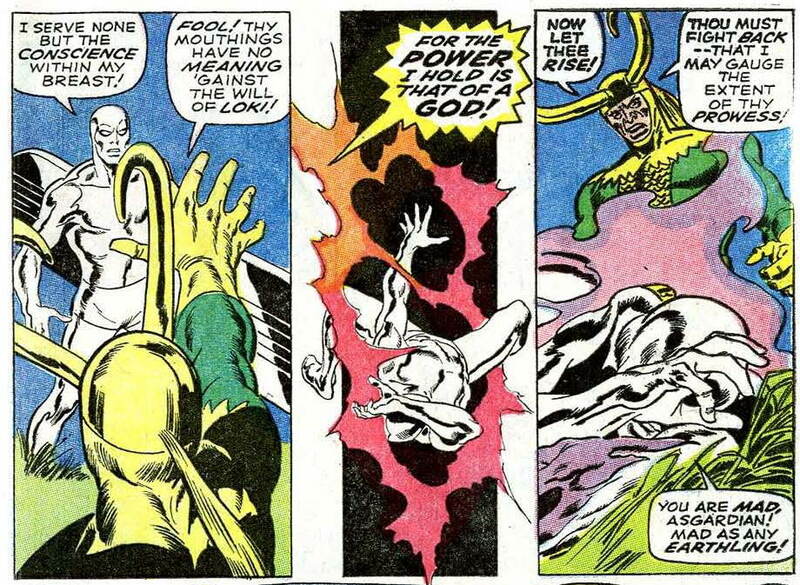 As the battle grows more furious, back in Loki’s lair, a nameless flunky wonders aloud how the Surfer can possibly prevail against Thor, when Loki’s own godly power has never quite managed to do so — to which his master angrily replies, “Fool! Hast thou so soon forgot? Loki’s power has been merged with his!” Uh-oh. 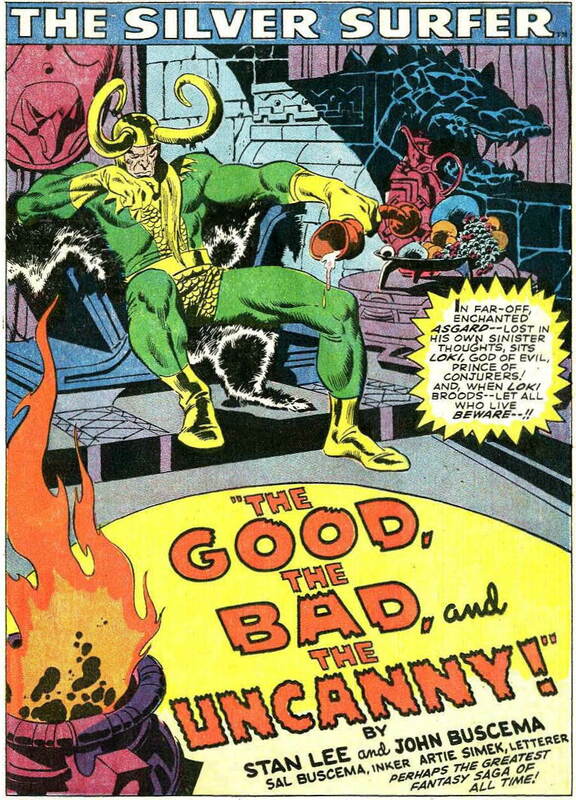 Meanwhile, a reader might ask, what’s Thor and Loki’s dad up to while all this is going down? Where’s the all-wise, all just All-father when you need him? 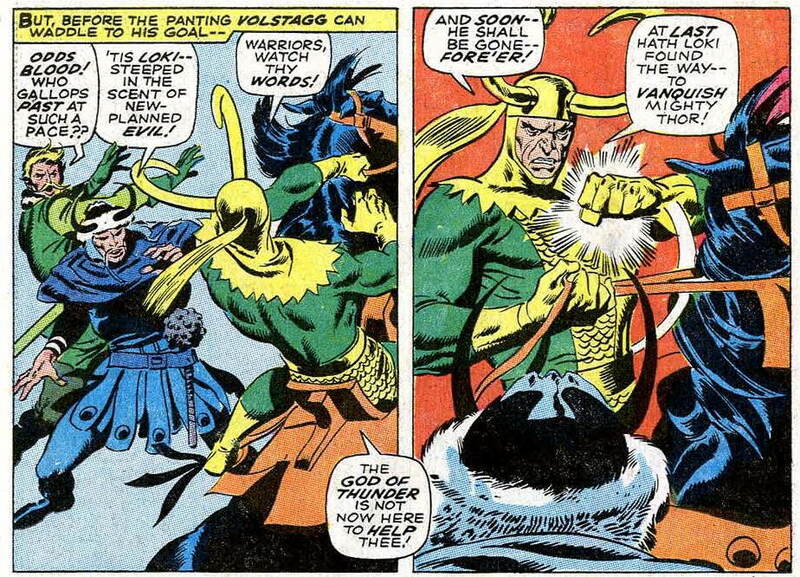 “No harm can come in combat when both hearts be truly pure!” Um, sure, if you say so, Odin. All-father knows best, I guess! Enjoy your nap, Big Daddy. It will likely come as little surprise to any reader who’s made it this far that Silver Surfer #4 is one of my favorite comic books of all time. That’s a wholly subjective assessment, of course, although I think one can make a strong, objective critical case that it’s the single best comic in Silver Surfer‘s 18-issue run; and, to go even further, one of the landmark issues in all of late-Silver Age Marvel Comics. 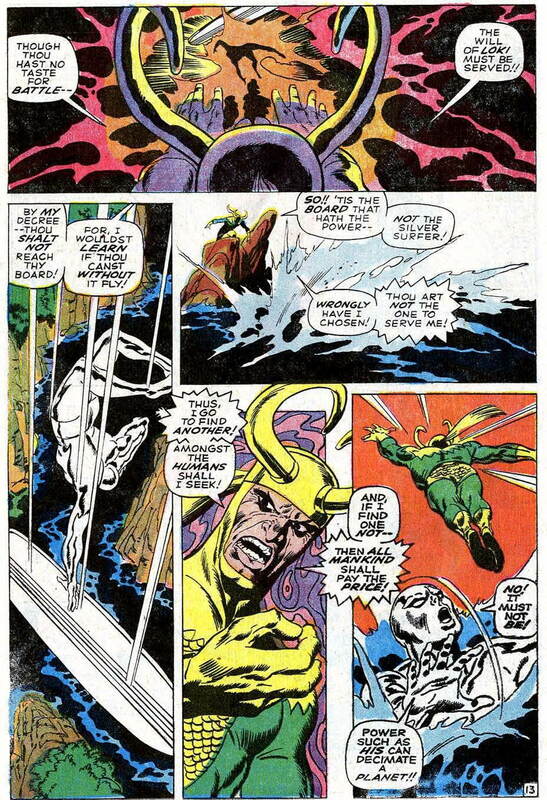 That’s in spite of the fact that, even taking account that one memorable scene of the Surfer soliloquizing in the jungle, it’s at least as much Thor’s story as it is the headliner’s. 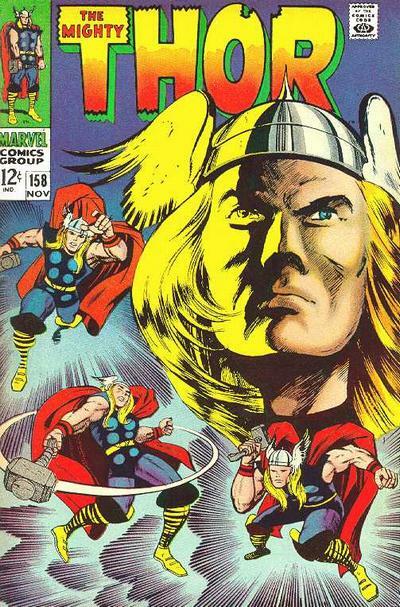 (Which, of course, is part of the reason why it did as much as any single Thor issue to make me a lifelong fan of the Son of Odin, as noted at the beginning of this post.) And, beyond that, it’s a great comic book in spite of the fact that its story is a very simple one. 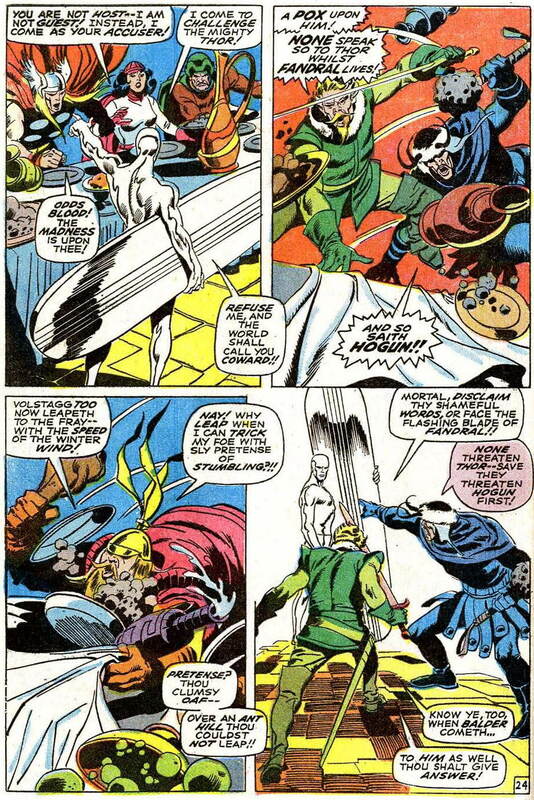 Indeed, the plot can be easily compressed into a couple of succinct sentences: Loki tricks the Silver Surfer into attacking Thor. 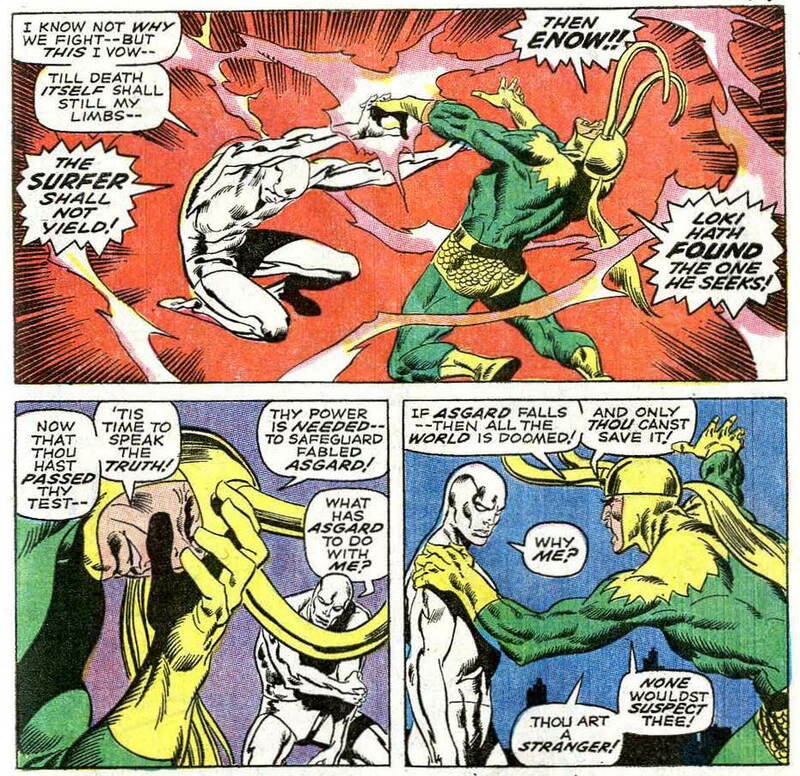 The two heroes fight until Loki’s deceit is revealed. The end. 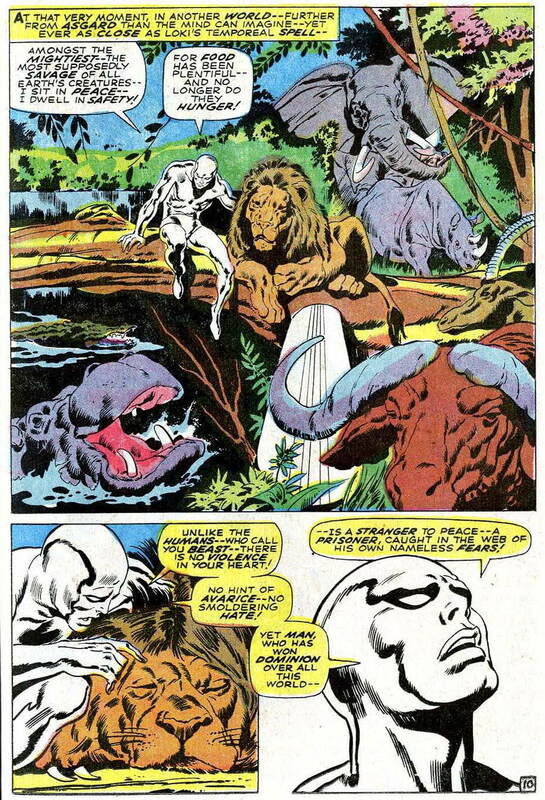 What makes “The Good, the Bad, and the Uncanny!” work as a story is the strong appeal of the characters and the settings, rather than the plot; and it’s the artwork, rather than the writing (again, taking into account the effectiveness of Lee’s prose throughout, and especially in the jungle scene) that makes the story soar, and ultimately lifts Silver Surfer #4 to the level of a great comic. 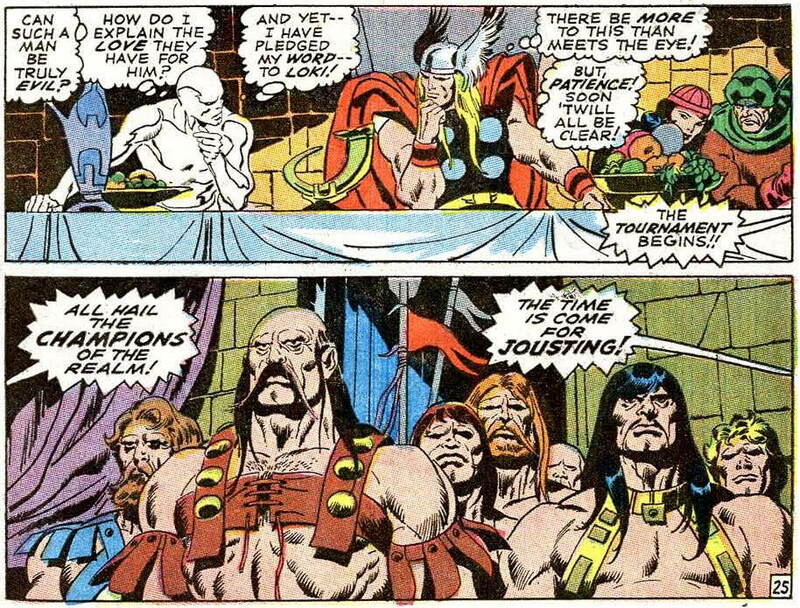 It’s a tremendous job by John Buscema, whose penciling is in peak form here, as well as by his brother Sal — probably as faithful and sympathetic an inker as the elder Buscema could ever hope to have, outside of himself. I remember John bringing in the penciled pages, and several of us ooh-ing and ahh-ing over them in the outer office. He seemed mildly pleased at our enthusiasm, and took the pages in to Stan’s office. What happened next I was not privy to, but John has related at various times, with varying degrees of diplomacy, that Stan “tore the job apart.” I recall his telling me, only a few days later when we met at Gil Kane’s Manhattan studio, that Stan’s first words to him after closing his office door had been, “Forget everything those guys out there said. The art’s all wrong, and here’s why.” Those may not have been Stan’s precise words, but that’s how John remembered them. 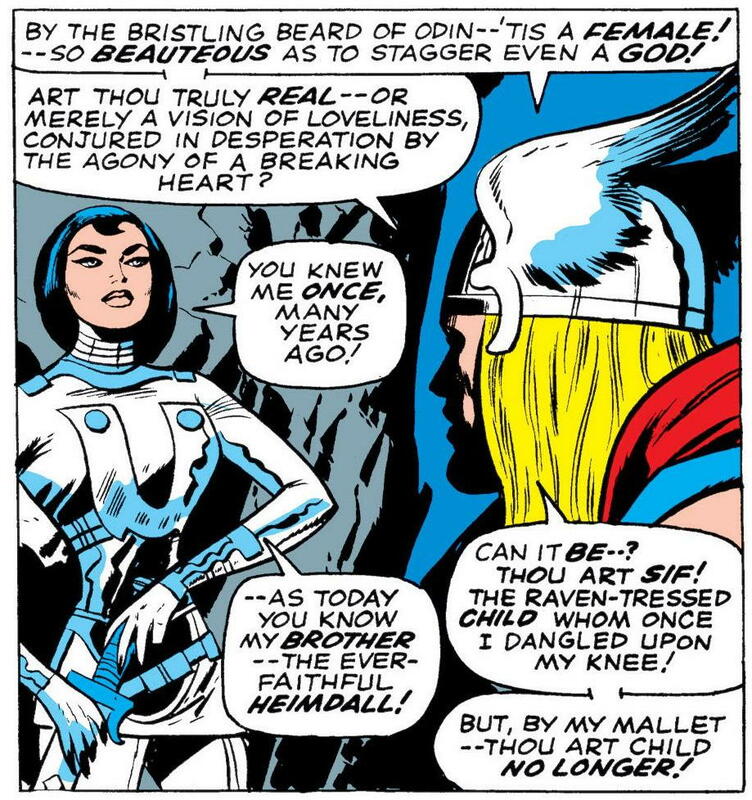 Since he had made a conscious choice in that story to alter the Kirby version of Asgard and the gods to something more Arthurian, and to move away from Jack’s style a bit in his storytelling, he was crushed when Stan didn’t like it. Maybe seven or eight years had gone by; I get a call from Stan one morning. We usually exchanged pleasantries – Stan said something; I think he called me an SOB or something (laughter) – and I said, “What’s up, Stan? What’d I do wrong?” He said, “John, do you remember that book we worked on, the Silver Surfer and Thor book?” I remembered it very well. “John, that was the greatest thing you’ve ever done, the greatest comic ever done, the greatest thing you and I ever turned out!” Well, I thought he was pulling my leg, and I didn’t say a word. 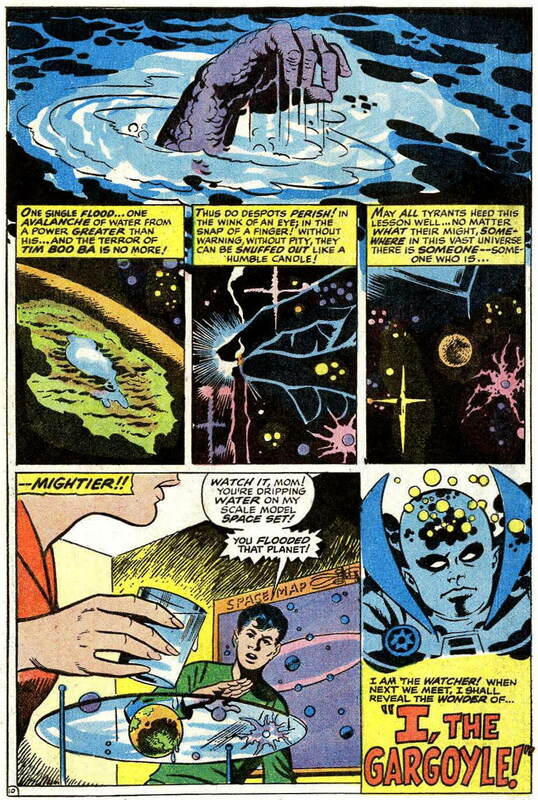 It’s not a case, perhaps, of one man being right, and the other wrong… but apparently John saw it, forever after, as a defining moment in his creative life… From that day on, John bent his efforts to becoming more of a Kirby clone than he had been heretofore, both in Surfer and elsewhere. 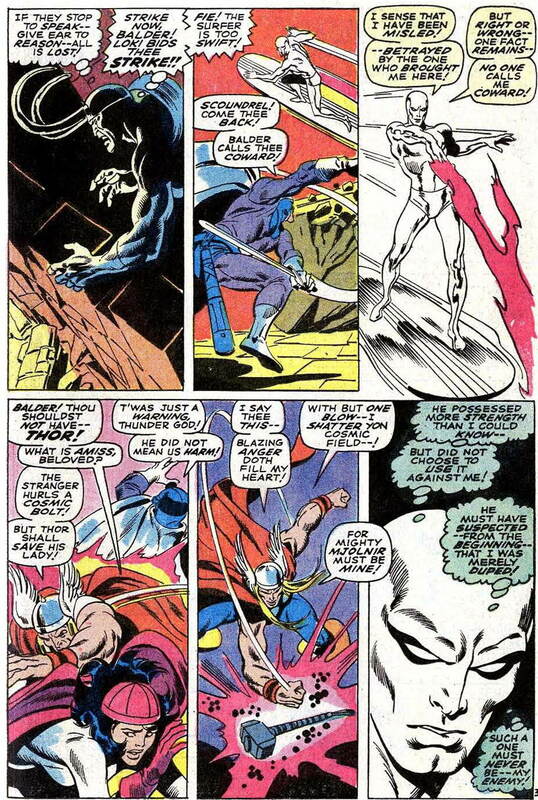 Thomas didn’t believe that this Silver Surfer #4 experience ruined John Buscema as an artist, by any means, as a reading of the entirety of his Alter Ego essay (and any number of other things he’s written, both before and since) makes clear; on the contrary, he had a high regard for his frequent collaborator, with whom he worked for decades on Avengers, Conan, and a myriad of other features. Still, I can’t help feeling when reading Thomas’s words that there’s a subtext of regret, there — a sense that something was sadly lost on that day in Stan Lee’s office, sometime in 1968. And it’s a regret I understand, at least a little. 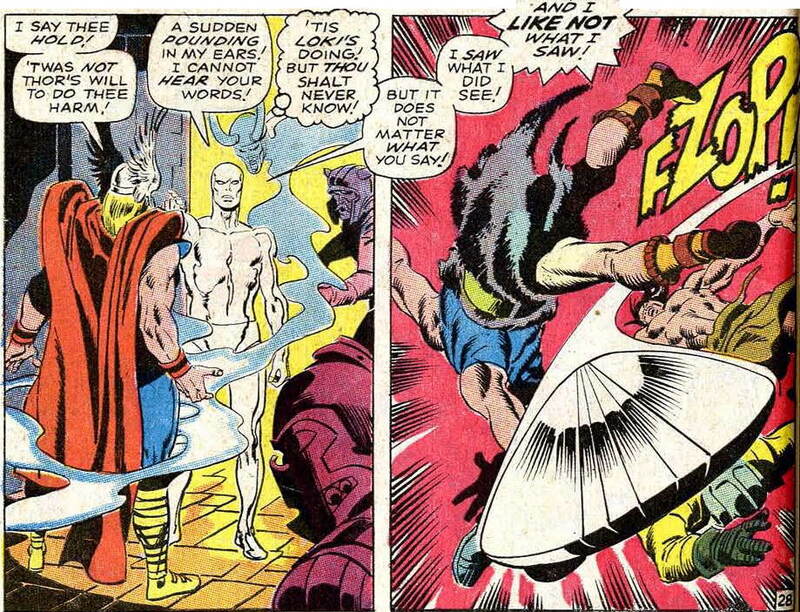 For years, while faithfully collecting (and enjoying) every issue of Thor that Buscema (and he drew a lot of ’em), I would wonder from time to time why, as good as they were, they weren’t as blazingly great as Silver Surfer #4 had been. Now, knowing the story behind the story, I can hardly help but wonder what might have been. In 1970, Jack Kirby left Marvel, after which Buscema, along with John Romita, became the standard bearers for the Marvel “house style”. 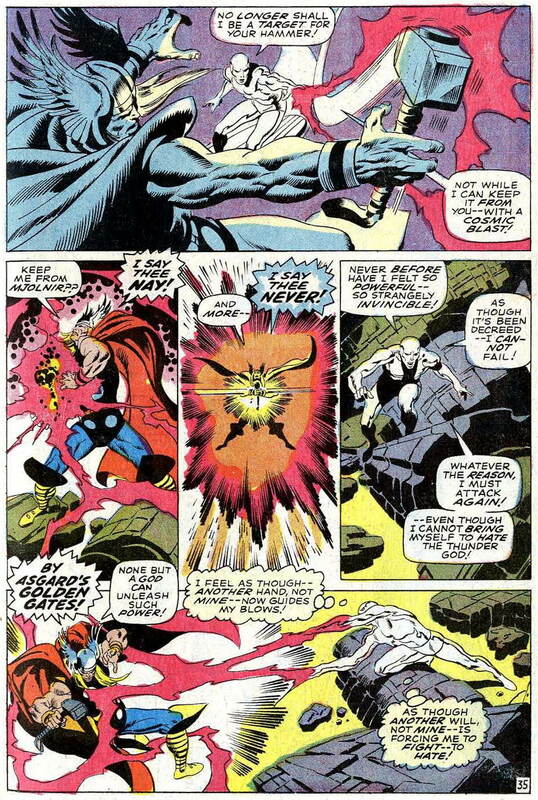 Perhaps Buscema would have felt compelled to bring his own approach more in line with Kirby’s at that time, even if the SS #4 incident had never happened. But perhaps he wouldn’t have — and the subsequent history of not just this one artist’s career, but of Marvel Comics itself, might be somewhat different. We’ll never know, of course. 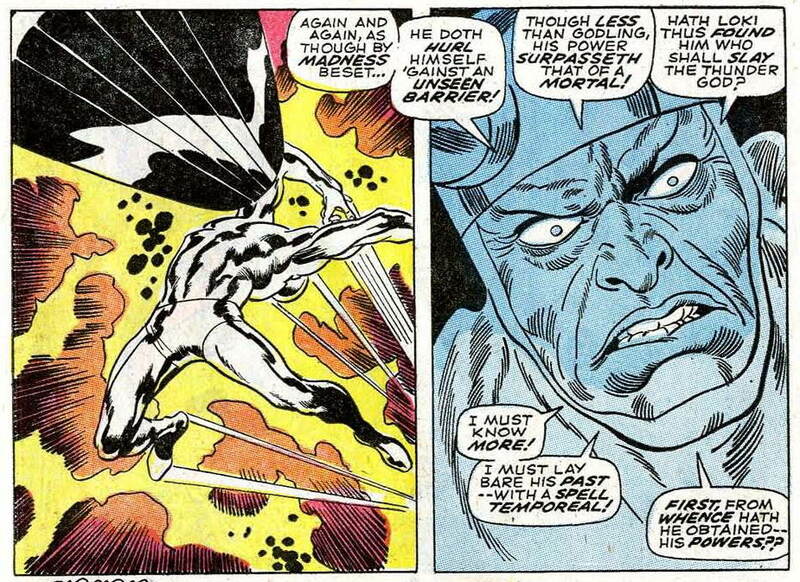 But at least we’ll always have Silver Surfer #4. 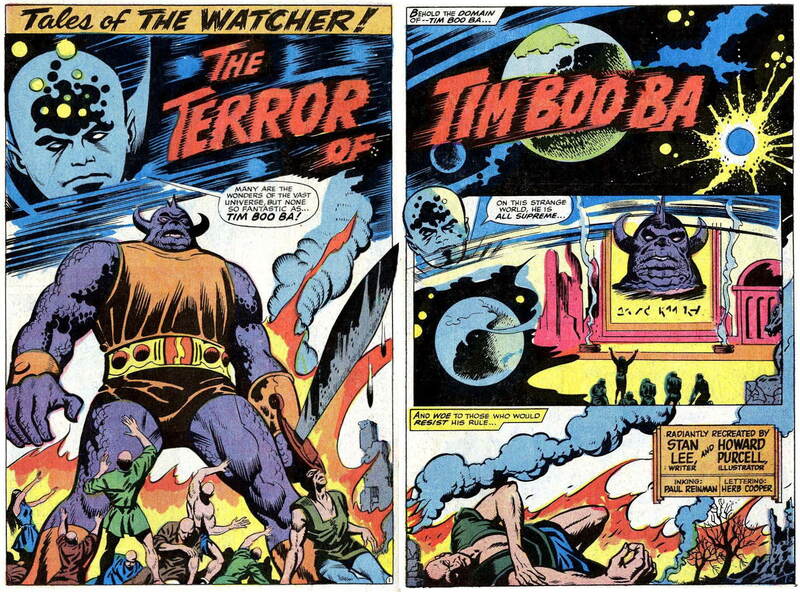 Like all the “Watcher” backups that ran in Silver Surfer’s double-sized issues, “The Terror of Tim Boo Ba” is actually not a “new” story, but rather an adaptation of a tale Marvel had originally published some years earlier. 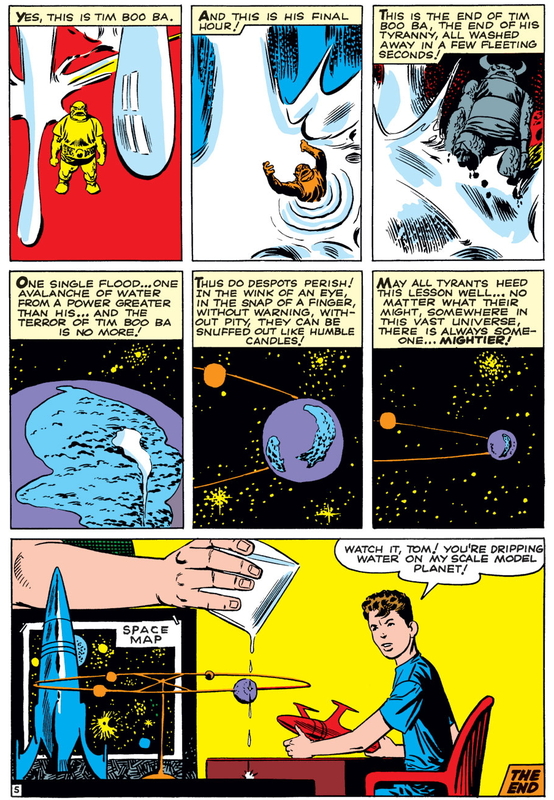 But while issue #1’s “The Wonder of the Watcher!” had been a reworking of the titular character’s 1964 origin story from the first “Tales of the Watcher” series (which itself had run as a backup in Tales of Suspense), issue #4’s offering adapts an older tale from one of the science fiction/fantasy anthology series that Marvel specialized in, prior to their 1961 re-entry into the superhero genre with Fantastic Four #1 — namely, “The Terror of Tim Boo Ba!” from Amazing Adult Fantasy #9 (Feb., 1962), written and drawn — as indeed were all stories that appeared in “The Magazine That Respects Your Intelligence” during its short run** — by the team of Stan Lee and Steve Ditko. The original story ran a mere five pages (the first of which was taken up with a single splash panel), while the “remake” runs for a full ten. Other than the shoehorning in of the Watcher as the story’s narrator, the new version’s script reads almost exactly the same as the old one’s — which makes it a very interesting exercise to compare the two. I say “partially-corresponding” because, of course, Ditko — with only half as many pages at his disposal as Purcell — has to fit at least twice as much info into each page. 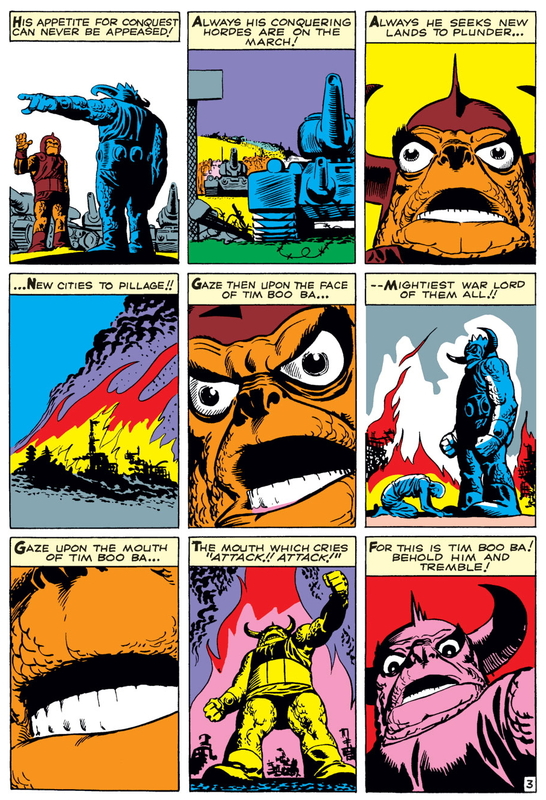 Working in a tight nine-panel grid (and aided by a script from Lee which largely eschews word balloons), Ditko varies between long, medium, and close-range shots (the latter always focused on the fearsome Tim Boo Ba) to great dramatic effect. 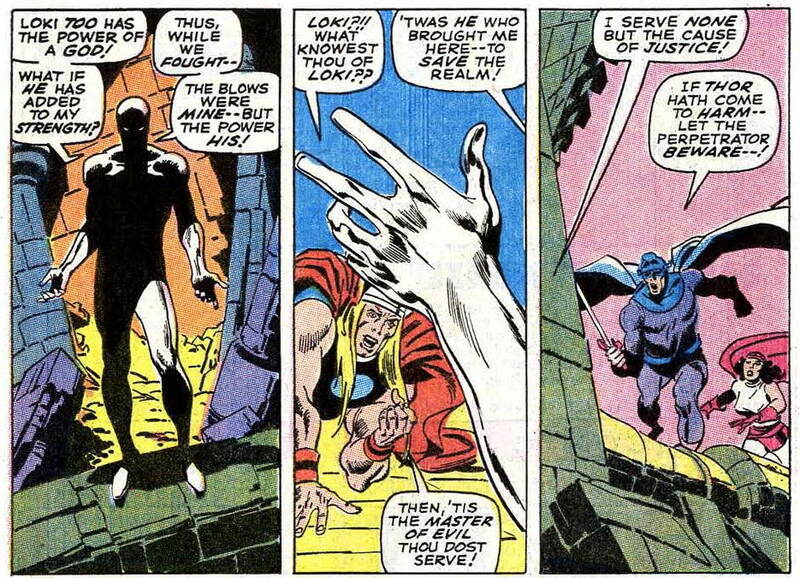 Purcell, for his part, can’t better Ditko for drama. 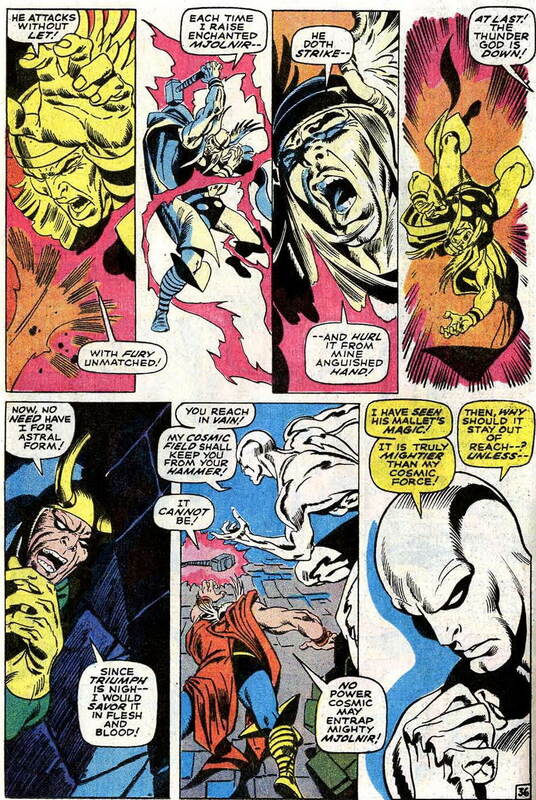 Wisely, he keeps to Ditko’s character design for the titular tyrant, at least for the most part (one notable exception is that he makes the tyrant’s eyes one solid color, hwhich robs the face of much of its expressiveness in Ditko’s rendering); but as far as the story’s other imagery goes, all he can do is make the pictures bigger. If he’d been the sort of artist who could fill a panorama with imaginative detail — like Jack Kirby, for example — he might have been successful in matching Ditko’s efforts on his own terms. But with all due respect to Mr. Purcell — a capable veteran illustrator who, in 1968, had the historic cover of Green Lantern (1941) #1 on his résumé, not to mention co-creator credits for Sargon the Sorcerer and the Gay Ghost — he just wasn’t that sort of artist. In the end, the remake of “Tim Boo Ba” may be twice as long, but it’s only half as good — at least in this reader’s opinion. Purcell takes advantage of the extra page to layer on the spectacle (an erupting volcano!) and also adds an unnecessary visualization of Lee’s “candle snuffing” simile — but Ditko’s single page remains more effective. Still, having said all of that — back in 1968, my eleven-year-old self had never seen Lee and Ditko’s original story, and so didn’t have the luxury of comparing the two versions. And this version worked for me, when I read it the first time. Of course, in either version, the twist ending makes little if any sense in straight science-fictional terms*** — but it still has the ironic punch of a classic fable. At least, it does for me. 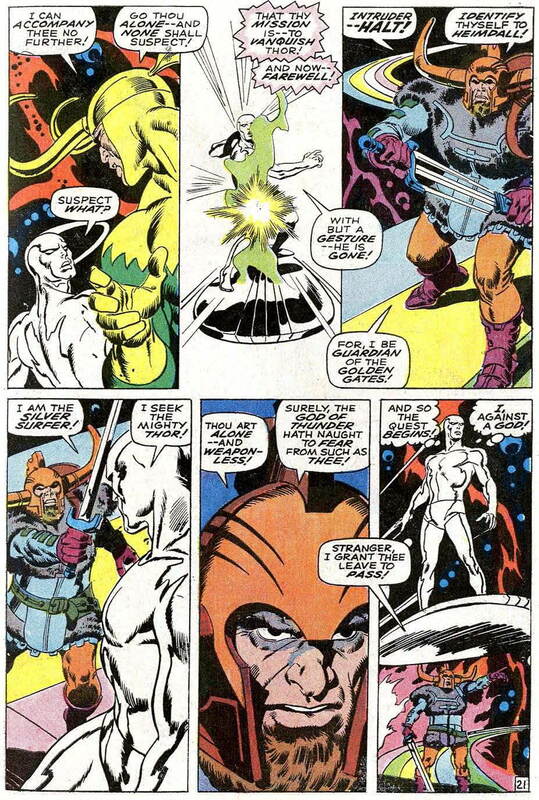 And for that reason, it deserves at least a small share of the credit for Silver Surfer #4’s ranking in my personal pantheon of all-time favorite comic books. *A question explored (though by no means answered) in my post on Silver Surfer #1 earlier this year. **Of course, the fifteenth and final issue of the title introduced a brand-new costumed character called Spider-Man, who proved popular enough to be promptly lifted from the cancelled anthology and given his own title — one which has done fairly well for itself over the decades. So, you could say that Amazing Adult Fantasy, though technically a “failed” comic, has had a very successful afterlife. 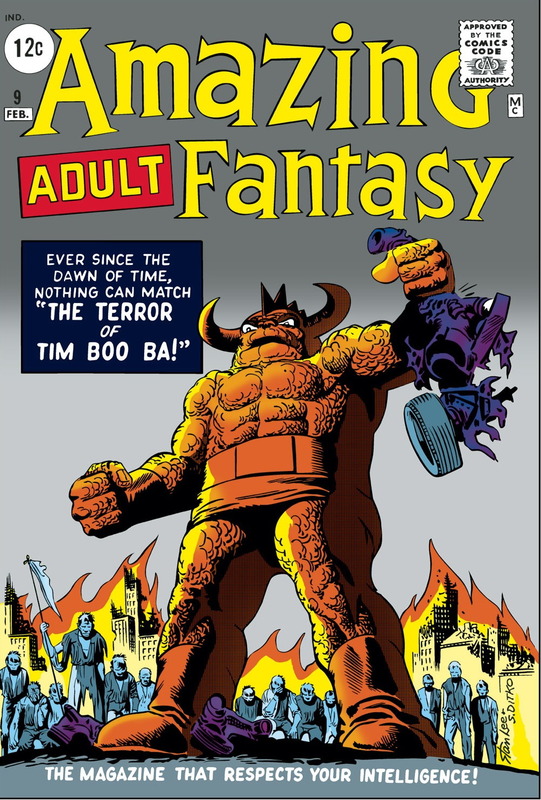 ***In a later decade, when Marvel decided it wanted to use Tim Boo Ba (along with a lot of other aliens and monsters from the old anthology titles) in new stories set in the “proper” Marvel Universe, his homeworld was retconned to become a world in the Microverse — meaning an extra-dimensional world that’s not in itself tiny, but which can only be reached by shrinking small enough to pass through a microscopic nexus. Yeah, that’s the ticket! Excellent write-up! The artwork on this issue by John & Sal Buscema is indeed beautiful and stunning. The account of Stan Lee’s initial reaction to Big John’s art is sad and unfortunate. I guess it is a good reminder that Lee was human. He was a tremendously important figure in the history of American comic books, but from time to time he did make mistakes. 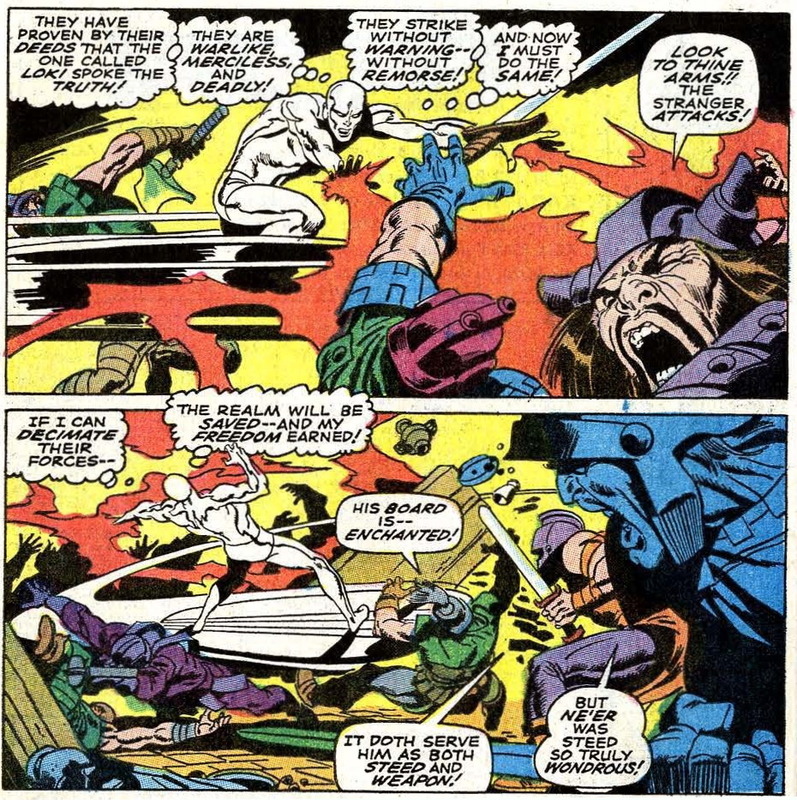 Lee seemed unable to perceive that Kirby was genuinely upset at the appropriation of the Silver Surfer, and his initial reaction to Buscema’s work for this story appears to have been a major miscalculation. Well, just like Lee’s super-heroes had flaws and were imperfect, so was Lee himself. If you have not read it yet, I recommend the book Sal Buscema: Comics’ Fast & Furious Artist. One of the things Our Pal Sal discusses is his collaborations with his brother. Sal relates how John really was critical of inkers, that if he could have he would have always inked his own work, but it just wasn’t economically feasible. As you can see, Big John could also be a bit harsh in his criticisms! Thanks, Ben! I haven’t read the Sal Buscema book (yet), but I did read an interview he did with Roy Thomas for the John B. tribute issue of “Alter Ego”, and he said much the same thing there. In the same issue, Thomas mentions that on several occasions during their “Conan” run John B. would express a wish to start doing full pencils and inks, and they’d accommodate him — but after a few issues he’d want to go back to doing things the previous way. Apparently, the economic incentive to turn out rough breakdowns, rather than finished art, was just too great. Yes, that’s a good example of the often-present dilemma artists faced working for Marvel and DC. They wanted to do their very best work, and they also wanted to make a living, and often it was impossible to do both in the world of monthly comic books. John Buscema very much preferred to do full artwork, but tight deadlines and low page rages unfortunately meant that he was seldom able to do so.